Kathmandu to Lukla helicopter flight is alternative way to fly from Kathmandu to Lukla airport for your trekking, mountaineering or peak climbing in Everest region. If you are bounded by time but want to fly to Lukla on time on your schedule then Kathmandu Lukla flight by helicopter is the best option for you. All private helicopter companies operates helicopter flight on charter basis to Lukla. It takes about 45 minutes to reach Lukla airport for a helicopter from Kathmandu. The helicopter flight is best alternative option if the Lukla flight is cancelled due to the weather. Flights to Lukla is weather dependent. So regular airlines flights might be cancel frequently. We offer helicopter flight to Lukla on private charter basis and group joining. Most of the helicopters can accommodate up to 5 person per flight. 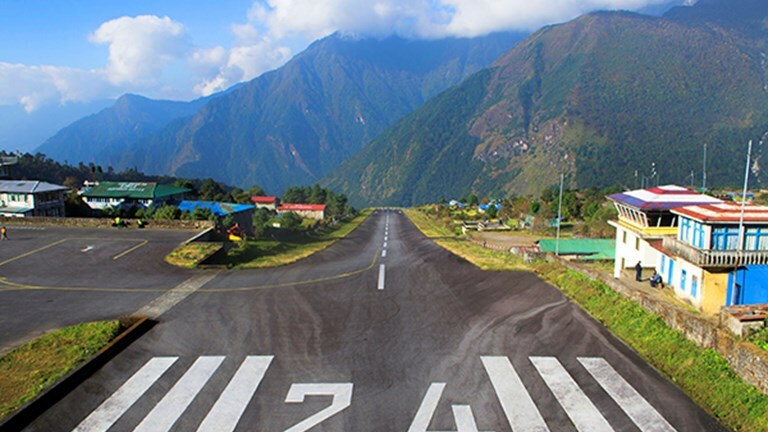 Lukla flights for private group is easy to manage and operate. We operate both private helicopter flights and group joining helicopter tours to Lukla and other part of Nepal. The popular helicopter flight tours are: Everest Base Camp Helicopter Tour, Annapurna Base Camp Helicopter Tour and Gosainkunda Helicopter tour. For the Lukla helicopter tour, it cost about 1800 USD for per flight. In a single flight maximum 5 persons can be accommodate. The helicopter is best for mountain views on the left side window seat. The total cost of the charter flight is share with the total number of people flying at a time. So the cost of the helicopter flight is flexible and also changeable. We offer group joining date as a fixed departure helicopter flight and collect people on cost sharing basis for the helicopter ride. The group joining helicopter flight shares the total cost of the helicopter flight with all the people flying together. If you are single and want to fly by helicopter ride then contact us with your desired date. If other people are planning to fly by helicopter on the particular date, then we accept your booking for the helicopter flight. Everest Base Camp Helicopter tour is more frequent on the trekking seasons. So we operate group joining helicopter flight for single trekkers. If you have enough group for the flight, then let us know about the date and time. Private helicopter charter flight are best way to explore the beautiful views with your own team. It’s your private helicopter ride, so private tour to Lukla is easy to operate on time. We arrange your helicopter flight with the powerful B3e series helicopter. In the B3e series helicopters we can fly up to 5 people at a time. The helicopter flight takes you to the base camp of Mt Everest. Flight to Lukla is weather dependent so, helicopter flights also depends on weather and conditions.